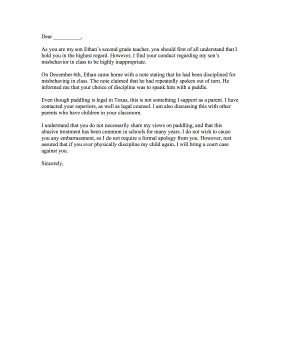 If teacher conduct steps over the line for a parent, he or she can use this school complaint letter to curb the behavior. As you are my son Ethan's second grade teacher, you should first of all understand that I hold you in the highest regard. However, I find your conduct regarding my son's misbehavior in class to be highly inappropriate. On December 6th, Ethan came home with a note stating that he had been disciplined for misbehaving in class. The note claimed that he had repeatedly spoken out of turn. He informed me that your choice of discipline was to spank him with a paddle. Even though paddling is legal in Texas, this is not something I support as a parent. I have contacted your superiors, as well as legal counsel. I am also discussing this with other parents who have children in your classroom. I understand that you do not necessarily share my views on paddling, and that this abusive treatment has been common in schools for many years. I do not wish to cause you any embarrassment, so I do not require a formal apology from you. However, rest assured that if you ever physically discipline my child again, I will bring a court case against you.